With its mediocre performance, outdated and inefficient two-stroke engine (which returned poor fuel economy for the car’s size and produced heavy exhaust), and production shortages, the Trabant is often cited as an example of the disadvantages of centralized planning; on the other hand, it is regarded with derisive affection as a symbol of the failed former East Germany and of the fall of communism (in former West Germany, as many East Germans streamed into West Berlin and West Germany in their Trabants after the opening of the Berlin Wall in 1989). It was in production without any significant changes for nearly 30 years with 3,096,099 Trabants produced in total. 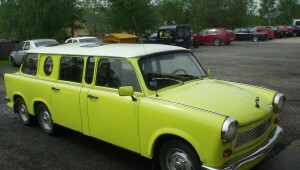 In 2008, Time magazine rated the Trabant as one of the 50 worst cars ever made. In the West, much has been written about the Trabant with mostly negative. Emphasis was placed on the shortcomings of the Trabant, and its benefits have not been pointed out. However, many of the former owners of the Trabant still emphasize its advantages such as high capacity – Trabant was able to drive over 1000kg of cargo.